King Abdullah Economic City (KAEC) is preparing for the opening of Bay X, the city’s first events center. Located in the vibrant waterfront Bay La Sun District, Bay X will be KAEC’s first enclosed exhibition center. The development, which already has a built-in roster of international companies in KAEC vying to use the facility to host conferences, meetings, and events, is the answer to KAEC’s growing need for an event hall that can accommodate the city’s business community. Bay X was designed and built by Losberger De Boer, a European company that specializes in building temporary event venues. For KAEC, the modular construction of Bay X will allow the venue to be completed in months instead of years. Losberger De Boer have offices across Europe, the US and in the Middle East that serve clients in the region delivering a wide range rapid-build, temporary event structures as well as semi-permanent building projects. As the Kingdom of Saudi Arabia ramps up efforts to market KAEC as a tourist destination, the need for hotels, transportation services, and event halls becomes more important. This is particularly true since the growth of the Meetings, Incentives, Conventions, and Exhibitions (MICE) industry in KAEC continues to expand. Without the Bay X exhibition hall, KAEC would not have the space it needs to accommodate the number of events being proposed. Recent reports say in the first half of 2017, KAEC attracted 300,000 visitors. This represents an amount that is twice the number of visitors who came to KAEC in all of 2016. Bay X is a 7,000 sqm multi-use center with 6.500 sqm of usable space on a 60m x 90m blueprint. The semi-permanent structure was designed to look like a permanent hall with lots of natural lighting and floor-to-ceiling windows. Within its walls are 2,800 sqm of hall space, 13 meeting rooms, conference rooms that are adaptable and resizable, with retractable hall divides. 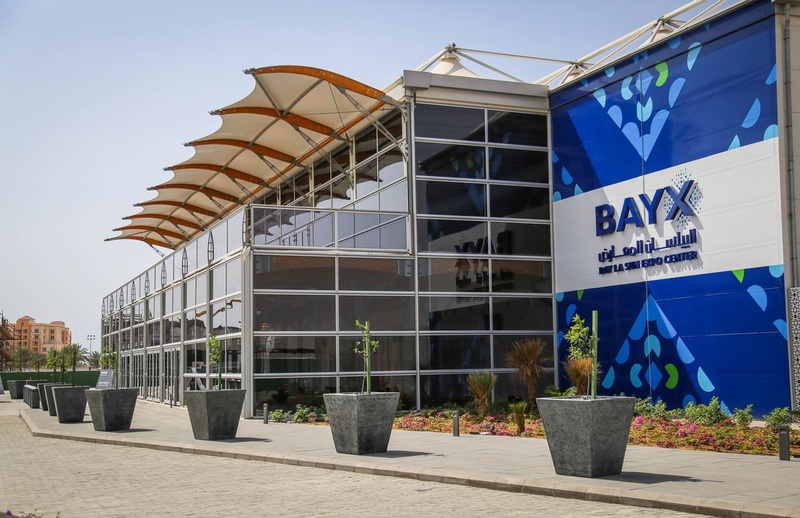 Bay X is KAEC’s largest venue and the largest facility of its type constructed in the Middle East by De Boer. Bay X is within walking distance of Juman Park, the picturesque Bay La Sun Hotel and Marina, and the Promenade waterfront. With the completion and opening of Bay X, KAEC will be able to effectively establish itself as a premier Middle Eastern destination for large-scale events, conferences, and exhibitions. Bay X is just another move toward solidifying KAEC’s position as the central economic hub of the Kingdom of Saudi Arabia.